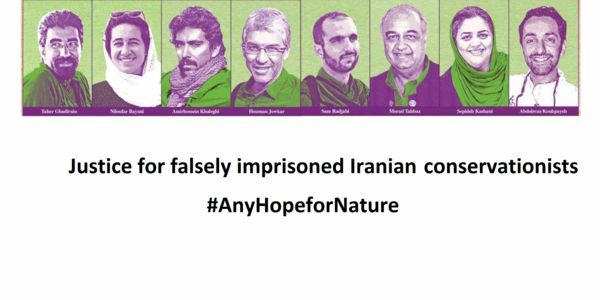 We, the undersigned international community of concerned citizens, hereby petition you to dispense fair justice to eight environmental scientists who have been detained in Iran. In February of 2018, Houman Jowkar, Taher Ghadirian, Sepideh Kashani, Niloufar Bayani, Morad Tahbaz, Amirhossein Khaleghi Hamidi, Sam Radjabi, and Abdolreza Kouhpayeh were arrested in Iran while working on different environmental projects. To begin with, many considered these arrests to be a mistake that would be rectified once it was made clear that these people were simply performing scientific research. Unfortunately, the situation only got worse as they were accused of spying, actions against national security, and sowing corruption on earth. These serious charges threaten their entire personal and professional lives, and the implications of these allegations also deeply affect the future of a country that is dealing with various environmental crises such as water scarcity, climate change, and biodiversity loss. In addition, accusations such as these negatively impact other young conservationists who consider their peers to be role models who inspire them to pursue careers in natural sciences, and to serve the nature and people of Iran. Field work and data collection are essential for scientists to understand many factors including the quality of habitats and promote effective conservation strategies. Using tools and technologies such as camera traps, binoculars, and laptops is common practice to collect accurate data in natural sciences. These methods are used to study animals and the environment, and then analyze the resulting data, and should not be considered a form of espionage. We are deeply troubled by the unknown condition of these eight environmental scientists in Iran, and the hardships they are likely to be suffering during their imprisonment. We wholeheartedly believe in the total innocence of these individuals and we demand fair and impartial evaluation of the evidence, access to independent attorneys of their choice, and a transparent public trial.